With Mesa semantics, when the first thread's resource becomes available, it is moved from the signal queue back to the entry queue. The second thread finishes executing, and the first thread will eventually be processes from the entry queue. This interpretation while simple, has a slight glitches. Perhaps by the time that the first process begins to execute again, the event it was waiting for has passed and the resource is again unavailable. The cycle may repeat. Hoare advocates a slightly different interpretation. If the first thread's condition is satisfied, it should immediatly execute. The second thread is put into a signal queue. When a thread exits the monitor, a thread from the signal queue is restarted. 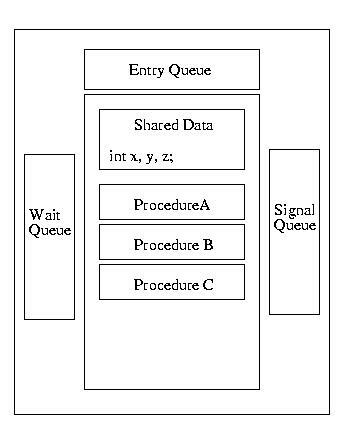 Only when the signal queue is empty, is the entry queue used. This approach is more compilcated, but leads to some nicer proofs. 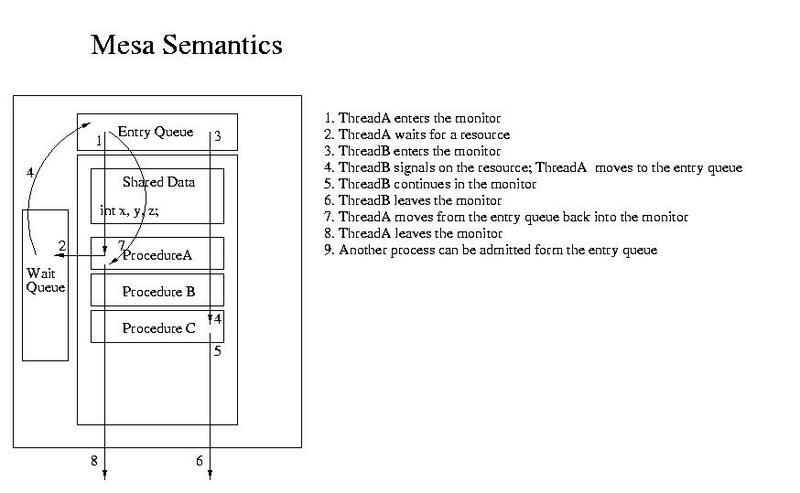 There is also a third type of semantics that often exists in monitors, Brinch Hanson semantics. It incorporates only the union of mesa and Hoare semantics. 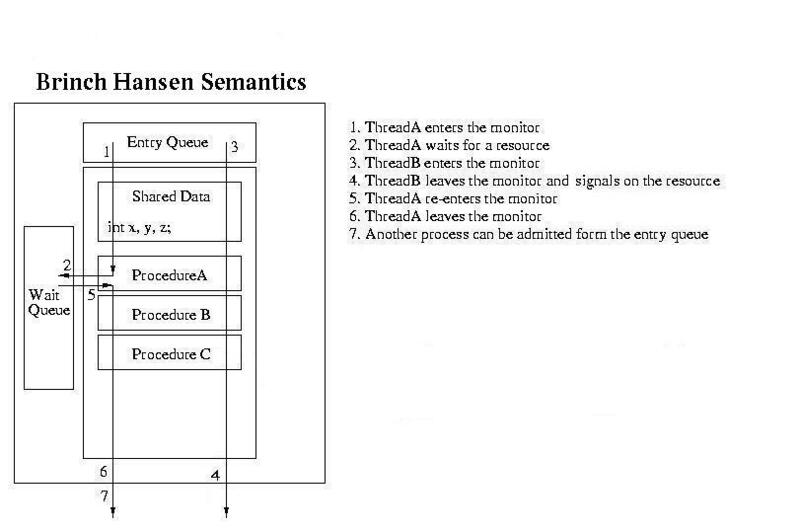 The Brinch Hansen monitor only allows a process or thread to signal upon exit from the monitor. At that point, the signaled process or thread can run; the signalling process has already left the monitor. Java monitors are reasonably limited -- especially when contrasted with monitors using Hoare or Mesa semantics. In Java, there can only be one reason to wait (block) within the monitor, not multiple conditions. When a thread waits, it is made unrunnable. When it has been signaled to wake-up, it is made runnable -- it will next run whenever the scheduler happens to run it. Unlike BH monitors, a signal can occur anywhere in the code. 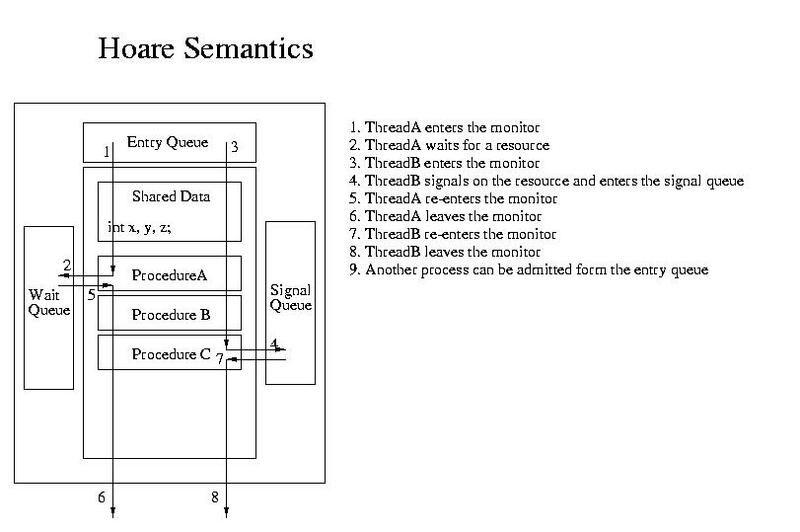 Unlike Hoare semantics, the signaling thread doesn't immediately yield to the signaled thread. Unlike all three, there can only be one reason to wait/signal.